ATLANTA (AP) — State lawmakers from around the country have formed an alliance they say will combat restrictive voting laws that have proliferated in recent years in Republican-run states, changes that won't face the same federal scrutiny after the U.S. Supreme Court set aside a key portion of the Voting Rights Act. Legislators from Georgia, Nevada and Iowa, among other states, announced the initiative Wednesday at Atlanta's Ebenezer Baptist Church, where Martin Luther King Jr. once served as pastor. Georgia state Rep. Stacey Abrams described the effort as nonpartisan, but leaders of the new organization – called American Values First – are all Democrats. Abrams said the group will promote model legislation and publish best-practices on how voting rights groups should respond in states that have already enacted new limits on early voting, rolled back registration opportunities and imposed new requirements that voters present identification before getting a ballot. One of King's last living contemporaries, the Rev. Joseph Lowery, joined lawmakers and called on an enthusiastic crowd at Ebenezer to join a renewed civil rights movement. "There must be something to this vote, because they spend so much time and money trying to take it away," Lowery said, referring to Republican legislators and governors as "Dixiecrats," an old label for Southern Democrats who opposed civil rights measures, including the Voting Rights Act. The 91-year-old Lowery recalled a sermon he delivered three decades ago. "The title was, 'Everything has changed; nothing has changed,'" Lowery said from his wheelchair. "I think I'll preach that again today." The event came two days after North Carolina Gov. Pat McCrory signed several election law changes, anchored by a photo ID requirement. The new rules also scale back early voting and end a pre-registration program for high school students who are nearing voting age. The Republican governor, who has joined with a new Republican legislature to give his state all-GOP rule for the first time since post-Civil War Reconstruction, called the measures "common sense" to guard against voter fraud. Voting rights activists immediately filed a court challenge. But the law will take effect as that suit plays out, without a federal Justice Department review that would have been required before the Supreme Court in June struck down part of the 1965 voting rights law. 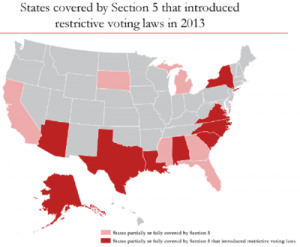 The law previously gave the U.S. Justice Department the role of approving election law changes in states and local jurisdictions with a history of voter discrimination based on race. Abrams, the House Minority Leader in Georgia, said the restrictive voter ID laws affect young and older voters, minorities and anyone else who may not have a valid driver's license. Several states, including North Carolina, have eliminated college student IDs as acceptable forms of ID. Abrams said some government requirements to get a driver's license, such as proving citizenship, residency and a Social Security number, add up to making it harder to vote. Nevada Senate Majority Leader Mo Denis cited legislation in his state to increase voter registration until the eve of elections, with an online system that required a valid driver's license and a Social Security number. Republican Gov. Brian Sandoval vetoed the measure, saying Nevada offers enough avenues to register. Denis said Wednesday there's never too many ways to expand ballot access. Meanwhile, Abrams highlighted Florida and Pennsylvania, where Republicans adopted new voting restrictions ahead of the 2012 general election only to watch President Barack Obama win those states, just as he did in 2008. "There's plenty of data to suggest that when you try to make it harder for people to vote, they just become more determined," she said.